As far as Liverpool debuts go, scoring a bicycle kick to seal a 4-1 victory over Manchester United takes some beating - friendly or not. 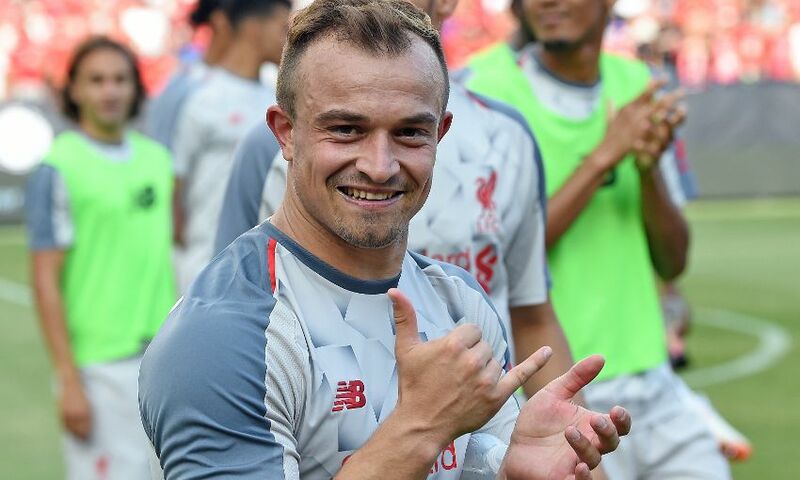 So it was little surprise to see Xherdan Shaqiri grinning from ear to ear after marking his Reds bow with an unforgettable strike as Jose Mourinho's men were swept aside in the final game of the club's tour of the United States. The Swiss, who completed his move from Stoke City earlier this month, grabbed Liverpool's fourth as he athletically smashed home Ben Woodburn's cross late in the second half. And, that the goal came in front of 101,000 fans at Michigan Stadium on what was his first appearance for his new club made the experience all the more incredible. Asked at full-time to reflect upon opening his account, Shaqiri told Liverpoolfc.com: "[It was] very beautiful. "I think I’m used to doing it [laughs]! No, I scored many times like this, I love bicycle kicks so I [am] always training this sometimes. "The ball was perfect and why shouldn’t you try? So I tried it and it was a very beautiful goal." Shaqiri was introduced as a second-half substitute as the Reds completed their International Champions Cup schedule in Ann Arbor. Having also set up Daniel Sturridge's goal in an impressive 45-minute outing, the wideman is confident he can build on his perfect start and make an impact at Anfield this season. He added: "I think it’s an amazing day; there are a lot of fans here and it’s my first game for this big club and I’m really happy and of course with the beautiful goal. "It was amazing to play with this great team, you can see this team has amazing players, I feel good and I’m very happy. "It’s a big club and I want to show my football too and you can see on the pitch that I have a lot of experience too. "I have played at a lot of big clubs and I want to help this team to go forward and I hope we can start a good season. "That’s important to have good friendlies and today was a good friendly for us and a beautiful win too."